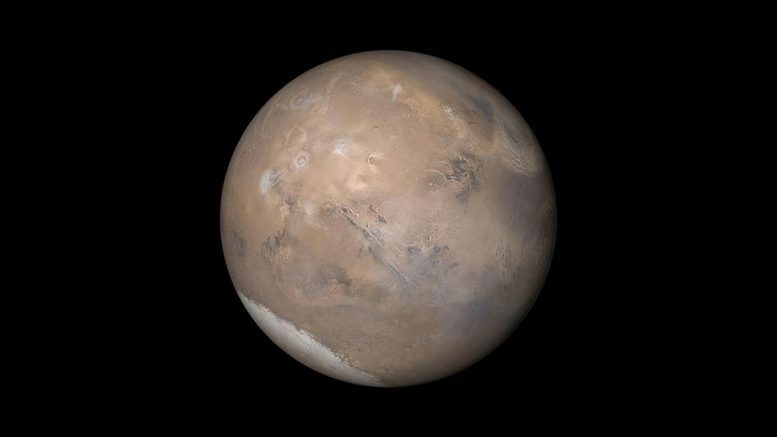 A new paper published in Science this week suggests that liquid water may be sitting under a layer of ice at Mars’ south pole. The finding is based on data from the European Mars Express spacecraft, obtained by a radar instrument called MARSIS (Mars Advanced Radar for Subsurface and Ionosphere Sounding). The Italian Space Agency (ASI) led the development of the MARSIS radar. NASA provided half of the instrument, with management of the U.S. portion led by the agency’s Jet Propulsion Laboratory in Pasadena, California. The paper, authored by the Italian MARSIS team, outlines how a “bright spot” was detected in radar signals about 1 mile (about 1.5 kilometers) below the surface of the ice cap in the Planum Australe region. This strong radar reflection was interpreted by the study’s authors as liquid water — one of the most important ingredients for life in the Universe. “We hope to use other instruments to study it further in the future,” Green added. One of those instruments will be on Mars later this year. NASA’s InSight lander will include a heat probe that will burrow down as far as 16 feet (5 meters) below the Martian surface. The probe, built by the German Aerospace Center (DLR), will provide crucial data on how much heat escapes the planet and where liquid water could exist near its surface. “Follow the Water” has been one of the major goals of NASA’s Mars program. Water is currently driving NASA’s exploration into the outer solar system, where ocean worlds — like Jupiter’s moon Europa and Saturn’s moon Enceladus — hold the potential to support life. Even protoplanets like Ceres may explain how water is stored in rocky “buckets” that transport water across the solar system. Be the first to comment on "NASA Releases Statement on Possible Subsurface Martian Lake"